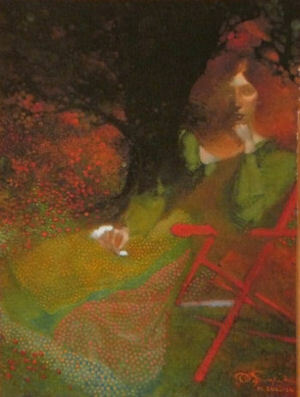 The Mark English I'm speaking of is an inspiring combination of oil paint, colored pencil and great imagination. It's the art of Hall of Fame illustrator, Mark English. I'd like you to savor his work to see if you learn some of the lessons I learned from it years ago. 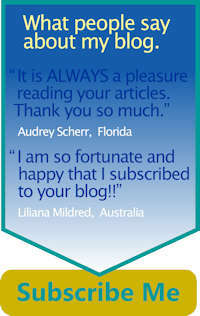 And while you savor it, I'd like you to be on the lookout for ideas to use in your own work. It doesn't matter what you use to paint. Much of what he does can be translated to other mediums and other subjects. It is more a matter of how you choose to adapt the ideas that interest you. Look at this first painting. One of things that pulls you into it is that he leaves a lot to your imagination; he doesn't tell you everything. The woman's face only partially emerges out of the background, creating mystery and visual surprise. The tree has hardly any detail. He provides only a hint of branches. And in the upper right corner even the hints are pretty abstract. The lower part of the woman's dress is done very simply. It consists of green underpainting and then yellow and red oil painted dots over top of it to create the shape of the dress. He subtly varies the intensity and darkness of these oil painted dots to suggest folds in the material and he continues the dot motif back into the background to suggest flowers. Colored pencil is used very subtly. It's really only apparent in the woman's face and hands, where he uses lighter colored pencils over a darker oil underpainting. Many of those same subtle touches are used in the painting at right of Mrs. Santa Claus. Blue and pink dots are used over a subtle green underpainting to define her dress. Colored pencil is used so subtly it is again hard to see which is oil paint and which is colored pencil over oil paint. But, it's not hard to see the design he created here. The star of the painting is the face of Mrs. Claus. He uses several tricks to pull your eyes to her. First, he surrounds part of her head with dark background colors, making it stand out. Second, her dress is a subdued shade of green underpainting, that creates a color contrast with the reds that dominate the painting. And third, Santa's bright red coat is like a finger that points your eyes to her face. 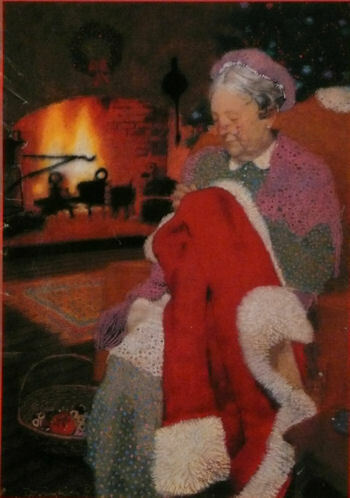 From her face the arch of the fireplace leads your eyes to the left where the dark left edge of the fireplace points you down to the carpet, then to her sewing basket with its red pin cushion and back to Santa's red coat. A design structure all nicely planned using controlled size, value and color contrasts. Size, value and color contrasts are also used in the last oil paint and colored pencil work I'd like you to see.This one was used in a tourist advertisement for the state of Missouri, if I remember correctly. 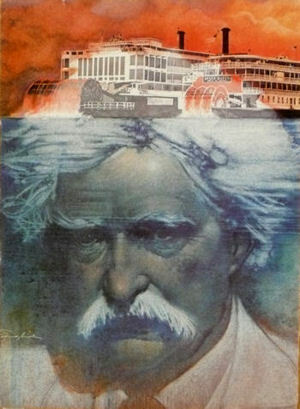 Here Mark Twain is done almost totally with colored pencil over an underpainting of dark, blue-green oil paint. Twain's face only partially emerges out of that water-colored underpainting, lending mystery to the whole piece. Notice that Mark English doesn't try to create realistic hair. He simplifies and only suggests it, just enough to give you the feel of Twain's bushy white crop. Now, I've shown you these paintings by Mark English not in the hope you will paint people or take up oil paint and colored pencil. You should paint whatever subjects most interest you with whatever medium you most enjoy. What I really hope you will take away from this article are two things. I hope you will feel some of the inspiration I got years ago from studying his work and I hope seeing his work will spur your imagination. It is your imagination that will truly set you apart as an artist, and I believe that by putting your imagination to work in whatever you do, that is when you will enjoy the most creative success.